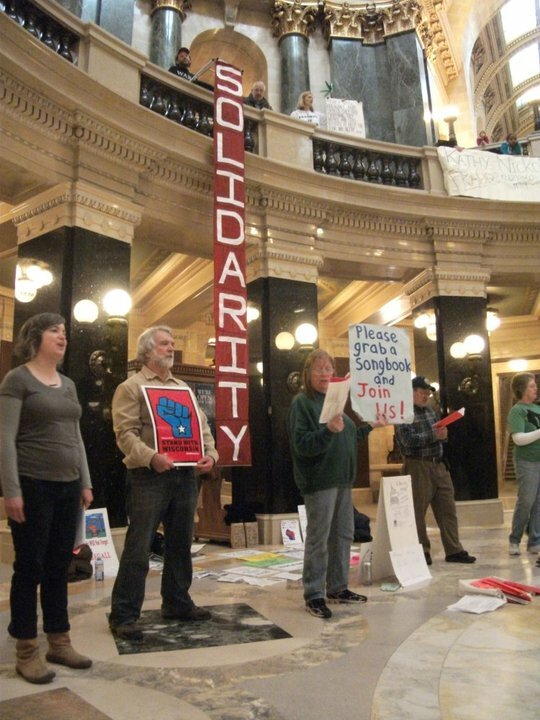 Since March 2011, a group of singers have gathered at the Wisconsin State Capitol to protest the government of Scott Walker. For over two years, they’ve exercised their right to assemble peacefully at noon and sing songs that express their outrage at the current administration’s policies and criminal acts that have gone unpunished. If and when permitted events are scheduled at the same time, the protest moves outside. Former Capitol Chief Charles Tubbs managed the crowds as nonviolently as the protests themselves. After Tubbs left, Walker brought in Chief David Erwin, hired in July 2012 to stop the singing. His concerns, as he stated, were to restore normalcy and safety to the Capitol, even though the Sing Along posed no danger. He began ticketing and, contrary to Webster’s claims, started arresting participants, including sending officers to private homes to issue tickets after the fact. About 90% of those tickets were dismissed, and Erwin’s troops fell back. 80-year-old Joan Kemble arrested for singing. 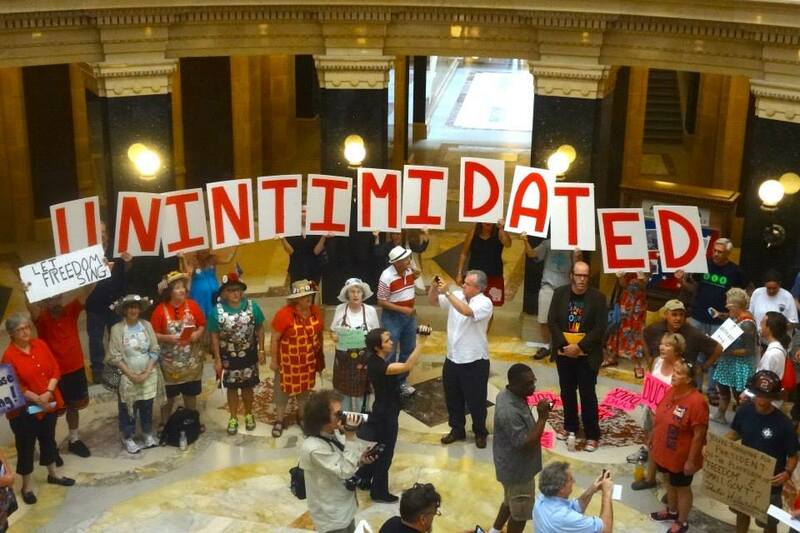 Then, on July 24, 2013 Erwin began another “crack down” of peaceful protesters in the Capitol. By Wednesday, August 20, 2013 the total number of arrests surpassed 250. Most are pleading “not guilty” and many are asking for a jury trial. As this recent surge of daily arrests includes firefighters, elderly, children, journalists, local officials and those coming just to observe the madness, the Solidarity Sing Along is exposing the very reasons they protest. The reasons for this protest are clear to those who understand the extent of illegalities and injustices that have been foisted upon Wisconsin since Walker took office. Lies and collusion have followed the state Republicans as they broke open meeting laws, fast tracked unconstitutional legislation in the middle of the night, rewarded their corporate cronies with huge give-aways, and successfully laundered millions of dollars through Wisconsin Economic Development Corporation (WEDC), to a name a few. However, with Wisconsin’s fourth estate also being held hostage by corporate controls, average readers of the Wisconsin State Journal and the Milwaukee Journal Sentinel might think nothing unusual is taking place. Walker targeted certain members of the press and actually used police force to keep them out of a press conference about WEDCs performance. Aside from the loss of open government, the dismantling of unions, health care, the economy, public education, and attacks on the environment and women, one of the most potentially damaging moves that Walker made was to allow Gogebic Tactonite LLC (GTac), an out-of-state coal mining company owned by billionaire coal magnate Chris Cline to author a new metallic mining bill. Even though the public was opposed to a 22-mile – mountaintop removal iron ore mine in the middle the Bad River Watershed, one of the world’s most pristine and unique water environments located on the shores of Lake Superior, Walker and his followers pushed it through anyway. Ignoring the overwhelming voice of the people who did not want the new law, the Republican majority passed the bill anyway. Sponsor Sen. Tom Tiffany (R-Hazelhurst) then promptly admitted it allowed for pollution. When Walker ordered the capitol crackdown on July 24, 2013, he was also preparing to launch a full scale assault of the northern part of the state. 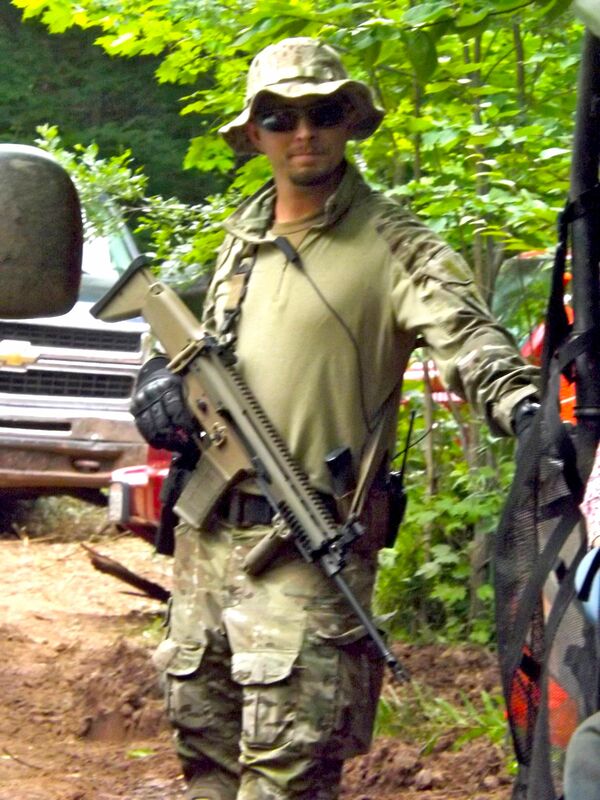 On July 6, 2013 GTac was caught employing an unpermitted out-of-state paramilitary militia carrying machine guns with silencers to keep observers out of the core drill sites. There GTac appeared to be making their first environmental mess. Bulletproof Securities was caught breaking the law and left town before being apprehended. However, GTac assured the public that Bulletproof would be back, and despite committing a felony, Bulletproof was given the proper permits and are now being allowed to patrol the north woods. According to GTac Lobbyist Bob Seitz, Bulletproof cleared out all “illegal” camps from the Managed Forest Land that they are leasing but required by law to share with the public. After two years of failed policies, corruption and media propaganda, Walker’s regime is starting to unravel, as demonstrated by the mass arrests for something equivalent to a parking ticket. This distraction is meant to keep the media’s eyes focused away from where Walker and his GTac cronies wants to strike: The Penokee Hills, on the shores of the last great body of fresh water in the world. They have already allowed a private paramilitary militia to take over 4,000 acres of public-access forest land. As the Solidarity Sing Along continues to face mass arrests, GTac prepares to push its way further into the northern part of the state. At a recent DNR hearing, the public once again testified that they do not want the mine, nor the company, to be allowed to do business in the state. Walker now has his private army in the hills of northern Wisconsin, and given them the power to enforce his law. With machine guns in hand, their bullets will be aimed at the public. Where it all ends is anyone’s guess. What was not said about the Bad River Watershed, is that Walker’s cronies have allowed for these mercenaries free reign to slaughter Native people on their own Reservation. So it’s open season on the Indigenous Peoples of Wisconsin, another Treaty broken in the name of greed by the white eyes. One of my in-laws originated in Bad River Rez.She would be crying to see, yet another atrocity done to her family that remained. This is the first article talking about the goon squads with machine guns with silencers on them on them outside of the Native News most people never heard of. We knew this when it first started to happen, you guys are really late to the massacre. And Walker is the guy the Koch’s are fronting for President in 2016. Fascism, here we come. WCMC has tried to cover this story since our inception back in Dec 2011. But yes, racism fuels this fight in a big disgusting way. Also the story of Bulletproof went viral around the world after Rob Ganson’s photos were released. But how many use the correct terms “fascism” and “genocide?” We are the only ones I know. Back when GTac first appeared, I began asking Native people if using the word “genocide” to describe what would happen to Bad River would be appropriate. Of course it is. We will keep reporting to the best of our ability. Hi Barbara, Thank you for the information. As I said, my in-laws were from 2 of Wisconsin’s Reservations. They moved to Michigan for better employment in the 1950’s. So I still keep tabs on what is happening back on the Rez. When I first read about the open order to eliminate the Native Peoples who were “in the way” I was appalled, saddened that this is still going on in America in this day and age, but not a word on any of the news I am able to find here. Did made no difference if they were children, women with babies and the people were just doing their daily routines, not causing any trouble, they are fair game. The ultimate goal was greed, once again. Anything or anybody gets in the way is exterminated. So where are all the politicians who are hollering and having a fit about the genocide taking place in other countries like Syria or Myanmar(Burma) while the same thing is happening in America today in Wisconsin and no one is saying a word to the rest of America. A united front is better than isolated movements whom Scott Walker wishes to divide and conquer. And the folks in Iron and Ashland counties are your advocates. Anthony Stella and so forth. Michael thank you for the links! And for the great thoughts. I feel that way. But sometimes things are so up close and personal its hard to see the forest for the trees. And the Don Miller story is heartbreaking. Almost enough to make me join up with a particular right wing radio show host who has been working to overturn that conviction. Stand strong and thanks again! I have been involved in social justice movements since I was about 17; and for what my opinion is worth, I would vouch for the Free Don Miller movement with the same commitment that I honor the memory of my mother who passed away unexpectedly and suddenly one year-plus ago. Don Miller’s supporters are a motley bunch, and I guarantee you they are righteous.